When we think about protecting and improving our immune systems (especially this time of year when sickness feels rampant), we typically think of popping Emergen-C, trying to get more than our usual three hours of sleep, and ordering the most vitamin C–filled cocktail on the menu. Tequila sunrise, anyone? Alas, those probably aren't the best strategies, and we know we could be more strategic when it comes to throwing our immune systems a bone come flu and cold season. "We are constantly being exposed to organisms on a daily basis that we ingest or come in contact with," explains functional nutritionist Samantha Franceschini. "Our Immune system is constantly on defense, and the strength of our immune system determines whether these organisms make us feel sick or slowly manifest into disease." Since no one likes being sick—this cheery time of year in particular—we asked the industry's top nutritionists to share which tasty foods can help boost our immune systems and why they love them. Spoiler: Immunity is very much linked to what's going on in our gut, so prioritizing gut flora above all else proves vital. "It is important to remember that 80% of your immune system lives in your gastrointestinal system," says Franceschini "A healthy gut contributes to a healthy immune system. It's all about balance, and if you are eating more anti-inflammatory foods that are rich in vitamins and phytonutrients, you'll automatically support healthy immune function." But let's elaborate shall we? Ahead,12 tasty foods that boost your immune system without sacrificing the integrity of your comfort-craving taste buds this season. Keep scrolling! 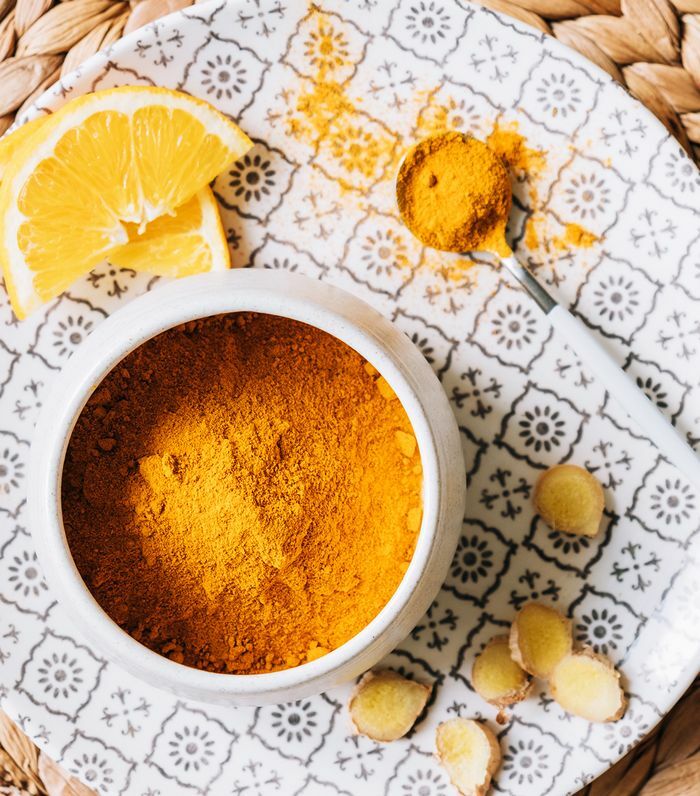 According to Los Angeles–based holistic nutritionist Elissa Goodman, turmeric is one of the richest sources of antioxidants and is therefore chock-full of the inflammation-fighting goodness our vulnerable immune systems needs. "Curcumin, the active ingredient in turmeric, is antiviral, antifungal, and can help keep the immune system strong," Goodman shares. "Just make sure to mix turmeric with black pepper, which increases absorption. I like to juice turmeric in addition to adding it to curries, sauces, soups, and coffee-free lattes." We already knew nuts and seeds are one of the best foods for our daily quota of plant-based protein and fats, but it turns out seeds (pumpkin, in particular) are filled with zinc—one of the most important minerals for staving off sniffles and sluggishness. "Zinc is an essential mineral for the immune system," Franceschini confirms. "An immune system without zinc is like an army without soldiers. Enjoy a piece of dark chocolate in the afternoon, toast up some chickpeas for a salad, or snack on a handful of pumpkin seeds to help to store optimal levels of zinc in the body." "Ayurvedic medicine has relied on ginger's ability to boost your immune system for centuries," says Goodman. "It's believed that ginger helps to break down the accumulation of toxins in our organs due to its warming effects. It's also known to cleanse the lymphatic system, our network of tissues and organs that help rid the body of toxins, waste, and other unwanted materials." She suggests enjoying a soul-soothing cup of warm ginger tea or sipping a low-sugar green juice enhanced with organic ginger root. Juicing is best done at home with your own raw materials, but there are also plenty of healthy options at the grocery store. Just steer clear of bottles featuring sky-high sugar content or any unnatural additives. Whether you prefer broccoli (or any cruciferous vegetable, for that matter) steamed, roasted, or riced, Farah Fahad, MS, RD, creator of The Farah Effect, says it's one of the best foods for supporting immune health. In reference to a study published in the Journal of Allergy and Clinical Immunology, Fahad says sulforaphane, a chemical found in broccoli, might activate antioxidants and enzymes in specific immune cells which fight the free radicals that lead to cell damage and disease. Remember what we said about gut health being paramount for optimum immunity? Yep, it's time to prick up your ears. "Keeping your gut bacteria healthy is one of the most important things you can do to stay healthy since roughly 70% to 80% of the cells making up your immune system are in your gut," Goodman shares. Source-wise, she recommends snapping up fermented foods like coconut kefir, tempeh, miso, sauerkraut, kimchi, or kombucha. "If you're in L.A., I love getting the tempeh Reuben in a collard wrap from Real Food Daily. They add sauerkraut so it’s two probiotics in one meal. I also frequently sauté tempeh in coconut oil, and kimchi fried rice is another favorite," says Goodman. "Dark, leafy greens are a well-known source of vitamins, minerals, and essential nutrients, but they are also a key source of specialized chemical signals that our immune systems use to communicate," says Goodman. Try loading up on greens with a few of her favorite preparations—hearty salads, greens sautéed with garlic and onion, or homemade green juice with kale or dandelion greens. "Medicinal mushrooms are amazing for supporting the immune system," exclaims Franceschini. She says adaptogenic options like reishi, Cordyceps, chaga, or maitake can boost the immune system due to their high antioxidant properties and ability to fight free-radical formation. That said, the vitamin D–filled varieties you find in the produce section of your grocery are great too. "The best way to consume mushrooms is to sauté them or add a superfood powder to your coffee, latte, or smoothie," she adds. "Additionally, mushrooms have been shown to support the liver in detoxification and protect the body's supply of mitochondria." According to Goodman, garlic is one of the best foods you can consume on a regular basis that will also help improve immunity. It's antiviral and essentially acts as an antibiotic against fungal infections, bacteria, and viruses. Fahad agrees and tells us the food contains more than 100 biologically useful chemicals (including alliin, alliinase, allicin, S-allyl cysteine, diallyl sulfide, and allyl methyl trisulfide), which lower cholesterol and kill off viruses. "Although garlic can be consumed cooked or raw, if your stomach can handle it, I recommend swallowing a raw garlic clove for optimal benefits," Franceschini adds. "Slightly smashing the clove before swallowing it can activate the allicin compounds before swallowing it like a pill." That said, those with a sensitive stomach can try mincing it up before throwing into a blender with lemon, herbs (such as oregano), salt, pepper, and honey to make a yummy salad dressing. You've likely heard vitamin C plays a vital role in supporting a healthy immune system, and as Fahad tells us, kiwi is one of the best (and most delicious) sources you can munch on. "One serving of kiwi (about two fruits) boasts 137.2 milligrams of vitamin C, which is a strong free-radical quencher and thus a strong antioxidant in the body," she explains. "When free-radical damage outdoes the body's ability to control the damage, the immune system can become depleted as well. Vitamin C plays a crucial role in enabling the body to keep the body's immune system's fighting ability strong and in check." "Several studies have linked the substance chondroitin sulfate, found in bone broth, to both anti-inflammatory as well as immune-regulatory effects," Fahad says. Essentially, bone broth might help seal the gut, which prevents the proliferation of bad bacteria and other potentially harmful invaders from compromising gut health and in turn our immune systems. "This in large part is due to the glycosaminoglycans (or GAGs) found in it. GAGs help to restore the intestinal lining. They also play a role in maintaining collagen and elastin content between tissue fibers." Fahad suggests using bone broth to sauté vegetables, as a base in your soups, or served straight up for a comforting pre-bedtime sip. Like pumpkin seeds and dark chocolate, legumes are another great source of the mega-immune supporter zinc. Eating your daily quota of the mineral (versus supplementing) might be a superior way to fire up your immune system. "Supplementing with zinc can help to strengthen the immune system, although I recommend always trying to get your minerals from food before exploring supplementation," Franceschini confirms. Lentils are yummy in dals, curries, soups, or even just thrown on top of a salad. We're all about balance here at Byrdie, and we fully condone having the foods and ingredients we love (sugar-filled and otherwise) when we're craving them, out with friends, what have you. That said, a finicky immune system most definitely prefers foods rich in vitamins, antioxidants, and minerals (like the above) over others. Here are three general categories of foods our experts recommend limiting if you're on an A+ immunity mission. Sugar and artificial sweeteners: According to Goodman, excess amounts of sugar will weaken the immune system far faster than anything else. And artificial alternatives, sorry, aren't any better. Both will have a negative impact on your healthy gut flora and can excite unwanted inflammation within the body. Processed foods: "Highly processed foods are loaded with preservatives and fillers, which are hard to digest," Goodman explains. "Over time, they'll tire the body's energy, digestion cycle, and immune system." She recommends sticking to the outer walls of the grocery store when you're out buying food staples, preparing your own food whenever possible, and reaching for organic vegetables, fruits, and grass-fed meats. Hydrogenated oils: All three nutritionists listed hydrogenated oils as a category to avoid if you're looking to bolster your immune system. "Vegetable oils like soybean, canola, and corn oil are highly inflammatory and can lead to inflammation," Goodman says. "Try to incorporate good fats such as coconut oil, olive oil, avocado oil, organic grass-fed butter or ghee, as these can be soothing for your gut and great for your immunity." She especially loves coconut oil, as it contains lauric acid, which has been shown to enhance immunity and has antifungal, antibacterial, and antiviral qualities.